Although it looks quite like a summery dish, Mexican Corn Cakes with a Fresh Tomato Salsa, Avocado Slices and Sour Cream go down really well at any time of the year. They can make a perfect light lunch served with salad greens. In a mixing bowl, whisk together the cornmeal/polenta, gf flour, baking powder, spices, herbs and salt. Add the cheese and chopped corn and mix until just combined. Add the beaten egg, milk or water, if needed, a little at a time, and stir until the mixture holds together. Shape the mixture into 12 evenly sized cakes, pressing down gently until the mixture stays together. Place the cakes on a baking sheet. Fry the first batch of corn cakes in a little oil over medium heat until golden brown, about 4 minutes. Flip and cook on the other side. While the corn cakes are cooking, mix all the ingredients for the tomato salsa. 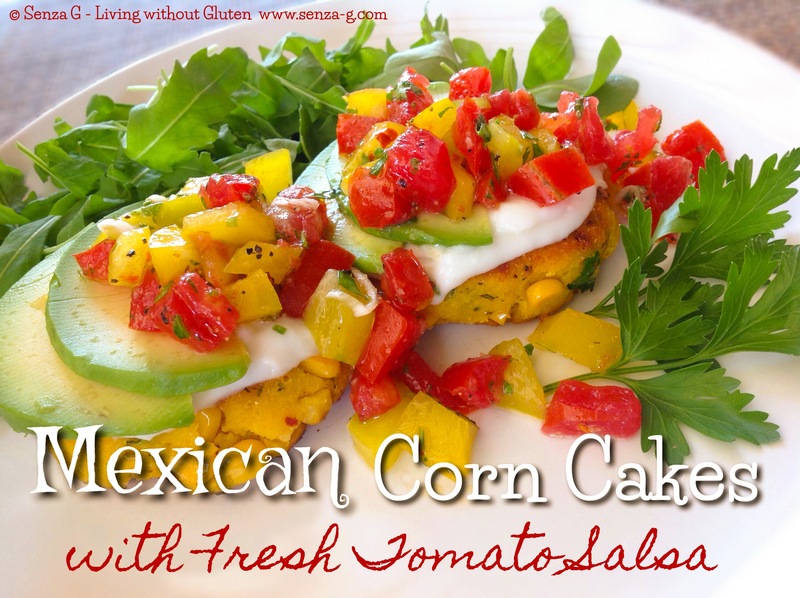 Serve the corn cakes warm, topped with slices of avocado, sour cream and the tomato salsa.